The Carex Designer Folding Derby Cane is an attractive and convenient folding cane. It is height adjustable and easily collapses for transport or storage. 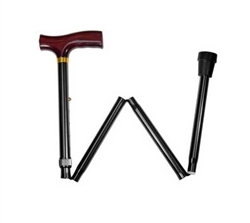 The aluminum folding cane collapses to fit into small spaces such as backpacks, briefcases, purses, suitcases, or under the car seat. It is black in color with a brown derby style handle.